What a gorgeous pavilion this was prior to renovation! Clarendon Municipal Bathing Beach, where Weiss Hospital now stands, could accommodate thousands of bathers a day. According to the Chicago Park District, the beach was constructed in 1915, taking its name from Clarendon Avenue, which in turn was named for English statesmen Edward Hyde, the first Earl of Clarendon. The pavilion was completed in 1916. 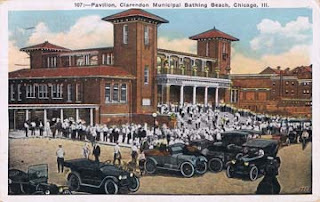 Clarendon was the largest bathing beach in the country, attracting 425,000 paying visitors the first summer and almost 2 million a year by 1929. It had two towers, separate locker areas for men and women, a playroom, and a laundry facility. It could accommodate more than 9,000 swimmers and had a promenade for thousands of spectators. It rented out bathing suits, towels, and lockers. The beach was very popular through the 1930s. When Lincoln Park was expanded up to Foster Avenue, Clarendon lost its lake frontage. The city converted the building into a community center, "adding gymnasiums, club rooms, a playground, and an athletic field." A major renovation in 1972 resulted in the removal of the elaborate towers and roof tiles. Today, it holds a gymnasium, boxing ring, fitness center, and meeting rooms. Programs include after school sports, aerobics, and preschool activities. You can get a thong, mug, or other unique items with this image through CafePress. I'm not sure about this, but I believe the current field house in the park is the base of the old bathing pavilion. You're right, Jeff. I added the info to the entry. Thanks for reading! In the mid to late 1960's we use to hang out At Clarendon Park. There was a baseball field and a very large building with stairs. From the pictures it may have been the bathing Pavilion. I remember the stairs because my nephew cut his head on them while I was babysitting. We used to play softball and ice hockey in the adjacent park in the 60s. Also went to daycamp in the Fieldhouse. Many many memories. Weiss Hospital is north of here at Wilson, not on this site. Again, wonderful posts! Just wanted to mention that yes, Clarendon Beach became Clarendon Park, and that it is a block south now of what is Weiss Hospital. A lot of this comes from oats, rice, alkatone keto potatoes, cereals and breads, and also from vegetables and fruits since these have chemicals, enzymes and micro-nutrients that are essential for a healthy diet.